The said series pumps are used to transfer clear water,rain water,water in iron sheet pits,sewage and seawater,servicing in power plants,iron and steel works,water supply companies,sewage treatment plants,petroleum and chemical industries,mines as well as municipal water supply and drainage projects,farmlands irriagation,flood protection and drain waterlogged farmlands,etc..The temperature of pumped media is below 550C and reaches to 900C for special design. The flow rate ranges from 30 to 20000m3/h and the head―from 7 to 200m. 1. Operation smooth,safe and reliable,starting without exhausting vacumn,service life long. 2. The volumn of the pump small,less occupied land area, the length under foundation adjustable,applicability strong. 3. Flowing channel simple and reliable,saving the investment for construction of the pump house. 4. Structure reasonable,convenient for mounting and dismantling,,easy to maintain and inspect. 5. Efficiency high, operating cost reduced. 1. Series LK ,LB pumps are of vertical single stage and/or multistage centrifugal or mixed flow with diffuser types. 2. The following structure types are available for the pump:the discharge opening above and/or under the mounting foundation(Type Code named S and X respectively);the axial thrust force born by the pump and/or by the motor(Type Code named T and D);lubricating water from outside and/or from the pump itself. 3. The intake sump is of wet pit and/or dry pit types. Wet pit type:lower part of the pump inundated in the intake sump. 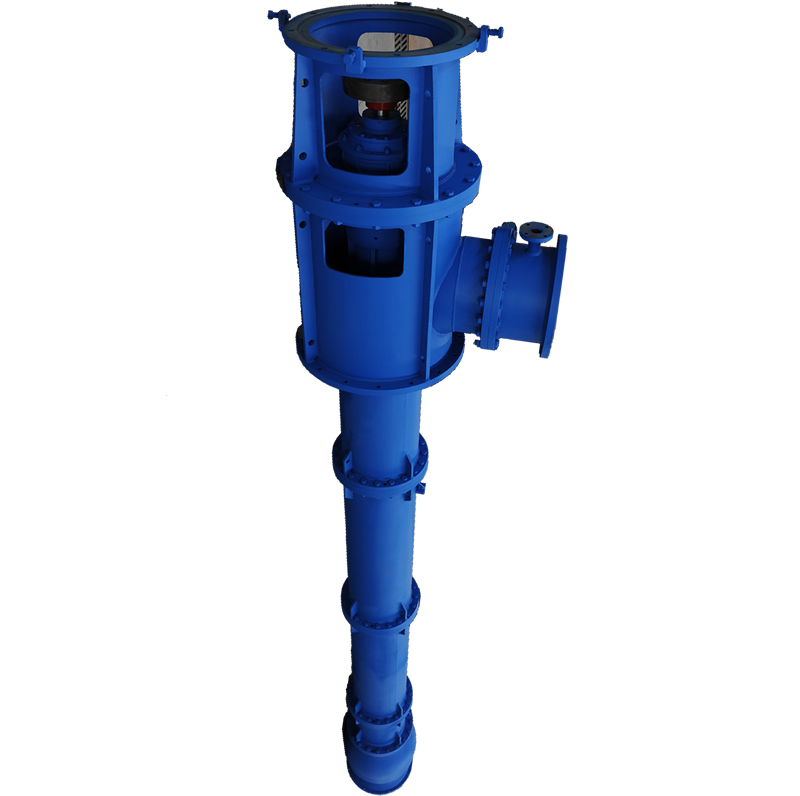 Dry pit type:the water enters into the pump,the suction bellmouth is connected with the inlet pipe of the pump by means of elbow bend pipe of 900. 4. Rubber guide bearings and /or the Thordon guide bearings are available for bearings of the pump. 5. Generally when the nozzle diameter of the pump is under 1000mm , non pull-out type is adopted for the rotor and the discharge opening is above the mounting foundation(Type Code named ST). In this case the axial thrust force and the weight of the rotor are usually born by thrust bearings of the pump itself and flexible connection is adopted between the pump and the motor.The thrust force and the weight of the rotor can also be born by the motor if required,or other structure types such as SD,XT,XD are available .Rotor pull-out type can also be adopted if required by clients. the pump if required,or other structure types such as XT,SD,ST are available .Rotor non pull-out type can also be adopted if required by clients. 6. When the axial thrust force and the weight of the rotor are born by pump itself,the thrust bearing of the pump is lubricated with dilute oil and is equipped with a temperature detector Pt100 to detect bearing temperature and a pressure type thermometer to detect the temperature of lubricating oil. 7. The antielectrochemical corrosion appliance is adopted for the part of the pump contacting the liquid to ensure the service life of the pump when seawater is pumped. 8. The packing seal is adopted for the axial seal of the pump. 9. The clearance between the impeller and the impeller chamber,i.e.the rotating component and the static component,can be easily adjusted on the pump mounting foundation. Remarks:Other materials are available at the request of clients.Cast iron is suitable only for closed type impeller.